These listings were compiled by DNAinfo's reporters: Emilie Ruscoe, Lisha Arino, Rosa Goldensohn, Emily Frost, Danielle Tcholakian, Lindsay Armstrong, Irene Plagianos, Shaye Weaver, Ewa Kern, Camille Bautista, Serena Dai, Nikhita Venugopal and Leslie Albrecht. Alice Cooper bassist and author Dennis Dunaway reads from his book about the band, "Snakes! Guillotines! and Electric Chairs!" Free and open to the public. Hear music from Dunaway’s new band with Blue Oyster Cult founder Joe Bouchard, Blue Coupe. You and your best bro can compete for an $150 cash prize at this TableHopping corn hole tournament. Team tickets cost $50 and include unlimited Brooklyn Brewery draft beer and kettle corn. If you can’t find a buddy, pay $20 and just watch. Tony award-winner Donna McKechnie and music director Steve Marzullo will perform songs from McKechnie’s new CD, “Same Place: Another Time.” Those who purchase the CD prior will be given priority seating. McKechnie will sign copies. The Met is opening its new installation of staged photography from over the first 170 years of the medium. Real life lovers Katharine Hepburn and Spencer Tracy star in this office romance from 1957, projected outside on the big screen. Free and open to the public. Bring a blanket for sitting on the lawn. 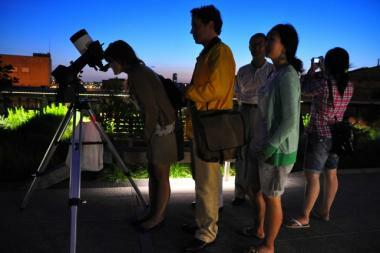 The city's Amateur Astronomers Association lends their expertise and high-powered telescopes to the public every Tuesday at dusk on the High Line at West 14th Street. Free and open to all. When: 12:30 p.m. to 3:30 p.m.
Bring the entire family for an afternoon of art making and refreshing iced tea in the Voelker Orth garden. You will get a chance to discover your inner artist while painting treasure boxes and sculpting monstrous creatures during various hands-on activities. Tickets are $3 for individuals and $6 per family. ► Free Rooftop Screening of "Grease"
When: 8 p.m. to 10:30 p.m., doors open an hour before the screening. The ultimate summer movie, "Grease" has John Travolta and good-girl Olivia Newton-John as 1950s high-schoolers who meet one summer and fall in summer love despite their differences, only to find out they attend the same school in the fall. Sing along to classic favorites like "Summer Lovin" and "You’re the One That I Want." A limited number of chairs will be available, or bring a blanket and a picnic — but no alcohol. Perform your sun salutations as you watch the sun set over Inwood Hill Park’s salt marsh. Bread and Yoga in Inwood will offer the free yoga classes through August 26. ► Movie Screening: "Dark Passage"
When: Starts between 7:30 and 8:30 p.m. at sunset. Bogey and Bacall are united in this 1947 film noir screening for free as part of BAM’s Artist in the Gardens. Bedford-Stuyvesant Restoration Corporation hosts its free weekly outdoor film series, with movies adapted from literary works of African-American authors. “Their Eyes Were Watching God” starring Halle Berry and Ruben Santiago-Hudson plays under the stars this week. When: 2:30 p.m. to 4:30 p.m. Learn to draw the human figure with this free outdoor class. A model will strike both short and long poses for participants to draw. An artist/educator will be on hand to offer suggestions and give critiques throughout the class. All drawing materials are supplied. Must be 18-years-old or older. Kids and families will be led through the museum’s Al Hirschfield exhibit and will learn about the artist’s expressive use of lines. Then they'll get a chance to make their own Hirschfield drawings. The event is free with museum admission. The classic 1993 film, starring Robin Williams and Sally Field, won’t start until it gets dark, but head to the free screening early to catch pre-show cartoons and music. The event is BOYB and moviegoers are encouraged to bring snacks to share. ► Free screening of "Wall-E"
When: Doors open at 7:30. Show begins at sunset. A G-rated, kid-friendly movie about a space-adventuring robot screens on the flight deck of the Intrepid. The movie will be introduced by Dr. Matei Ciocarlie, a robot-building engineer at Columbia University. Bring lawn chairs or a blanket. The event is free and open to the public, but you have to get the free tickets at the Intrepid starting at 6:15. Be sure all members of your party are in line by 6:15 p.m. Attend a screening of Stanley Kubrick’s 1964 dark comedy “Dr. Strangelove or: How I Learned to Stop Worrying and Love the Bomb” in Brooklyn Bridge Park. Syfy Movies with a View is a summer outdoor film series that takes place Thursday evenings during July and August. When: Happy hour begins at 5 p.m. and trivia will begin at 6 p.m. Spend prime sunset-watching hours competing in New York-themed trivia over a glass of local beer or wine for sale at Table Green in one of The Battery’s picturesque gardens. The event is free, but if you want drinks, you’ll have to pay. ► Free Outdoor Screening of "Wizard of Oz"
When: 6:30 p.m. to 10 p.m.
Settle in to one of the last Union Square summer events of the season and follow Dorothy and her ragtag pals along the Yellow Brick Road in pursuit of courage, a heart, brains and a way home. ► Exhibit Opening: "In Search of One City: Sensing (in)equality"
Celebrate the opening of a two-month exhibit at the Old Stone House that explores artists' interpretations of income inequality in New York City. Artists in the show offer their critiques of the disparities that define our city, as well as their own ideas for solutions to income inequality.